Let me say up front that Ive always been partial to paper books. I never really wanted to get into reading e-books. I have more paper books than I will ever have time to read. So I never expected Id buy a Kindle or any other kind of e-book reader. At the end of December last year, I changed my mind. I was contemplating the possibility of major surgery that could keep me in bed for who knows how long. I did not know how much hospital time that might include. I did not want to run out of reading material. I wanted something that could easily go with me anywhere. So I bought my first Kindle. Since I got it, I've done a lot more reading. Why? It's so easy to slip the Kindle in my purse and take it everywhere. If I have to stand in line, I just pull it out. Sitting in a waiting room? Pull it out of the purse. When I have to close it, it saves my place. If I want to read something different than what I started, no problem. I've got almost a hundred books to choose from on that small e-book reader. All I have to do is switch. Why Did I Buy the Paperwhite 3G? - I needed a lot of features . First, I decided that of all the manufacturers, Amazon would probably be around to support its product the longest. This is important to me. Second, I read all the information on the Amazon site about the different Kindle products. I wanted to be able to read in any kind of lighting, since I might be in a hospital room with poor lighting. I wanted to be able to change the size or font of the text for easier reading. I didn’t want to worry about losing my place if I had to put the Kindle down for a few minutes or a few hours. I wanted to be able to bookmark important pages and highlight passages. I wanted the whole experience to be easy on my eyes. After reading all the specs and about all the features, I decided that the Kindle Paperwhile 3G would best meet my needs. It had all the features I mentioned above and more you can read about if you click the product link I have included in this lens. Because I bought a product with both 3G and wireless connections, I should be able to download books from Amazon almost anywhere with a 3G signal or a wireless connection. 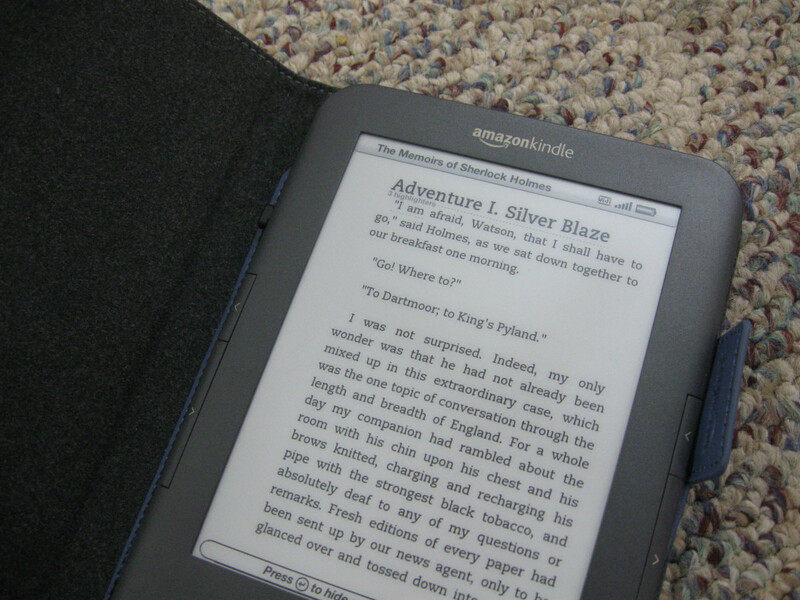 This photo shows my Kindle Paperwhite charging when it was new for its first use. It doesn't matter how you read, as long as you read. What I Like About Using My Kindle - There's a lot to love. keep that Kindle display bright. This is very handy for charging your Kindle Paperwhite anywhere. It plugs into my electrical outlet and charges while I sleep. I can also read while it's charging. I think this is a necessary accessory. One thing I love are all the free books I can download on my Kindle Paperwhite. I can usually find one or two a day that interest me. I am loading the Kindle with books because I do have a surgery scheduled next month that will keep me flat on my back for two weeks at least and away from my computer. Meanwhile, I’m having to discipline myself not to read too much, since it’s easy to start a book while eating or sitting on the throne and then not be able to put the book down when I have work to do. I really like that it’s easy to read in bed because the Kindle has its own light, which I can easily adjust to the degree of brightness I want. To dim or brighten the light, just click the light bulb on the tool bar at the top. The downside of this is that I now have a sore neck from looking up all the time. I need to get a reading pillow. That won’t work, though, when I have to keep my foot above my heart. I just ordered a stand to prop my Kindle up on a bed tray. 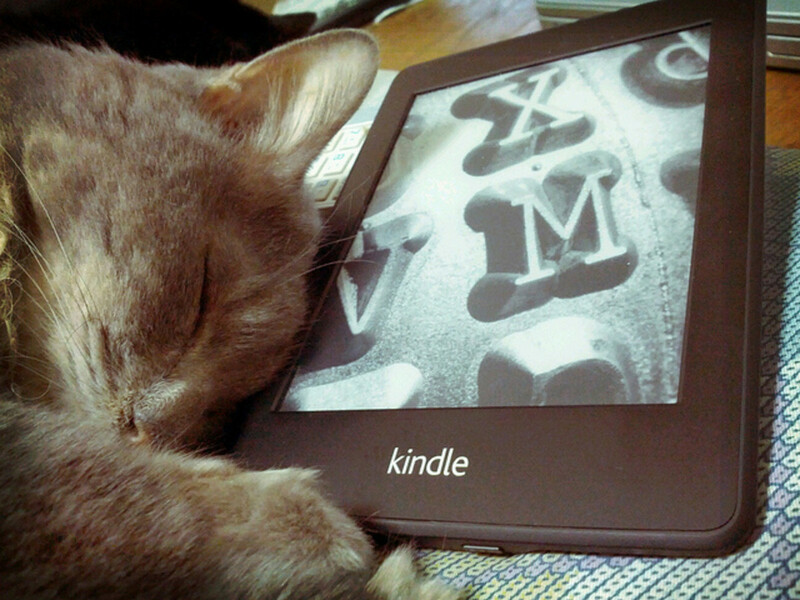 One really nice feature is that the Kindle lies flat. I have it in a case that protects it, and I can put it on the table to read if I’m eating alone. I can turn the pages with just one finger. If I put the Kindle down, it remembers where I stopped reading. If I’m reading more than one book at a time, it keeps my place in all of them. So I may have my Bible, a book that tells me how to do something, and a novel, all open at the same time. When I switch from one to the other, I can start reading right where I stopped. If I’m reading my book and come across I word I don’t know, I can hold my finger over it lightly and I will see the definition in the default dictionary I have chosen. If I hold my finger there too long, I will begin selecting to highlight a passage instead. To escape from those modes I tap lightly again. There is also a feature called X-Ray for most books. Let’s say you are reading a novel and you forgot how one character is related to another or you want to know more about that character. You can go to X-Ray and click on People and then chose whether you want to see only the people on that page, in the chapter you are reading, or in the whole book. You can do the same things for various terms you might want to trace. The X-Ray feature isn’t active for all books. You can see the X-Ray screen in the photo gallery below. It's open to show all the characters in the book Inescapable by Nancy Mehl. All my screen shots in the photo gallery come from that book. Sometimes I download books from sites other than Amazon, and some of these books have smaller print than I find comfortable. All I have to do is go to the tool bar and tap the text icon to adjust the print size and / or the font to one that’s easier on my eyes. 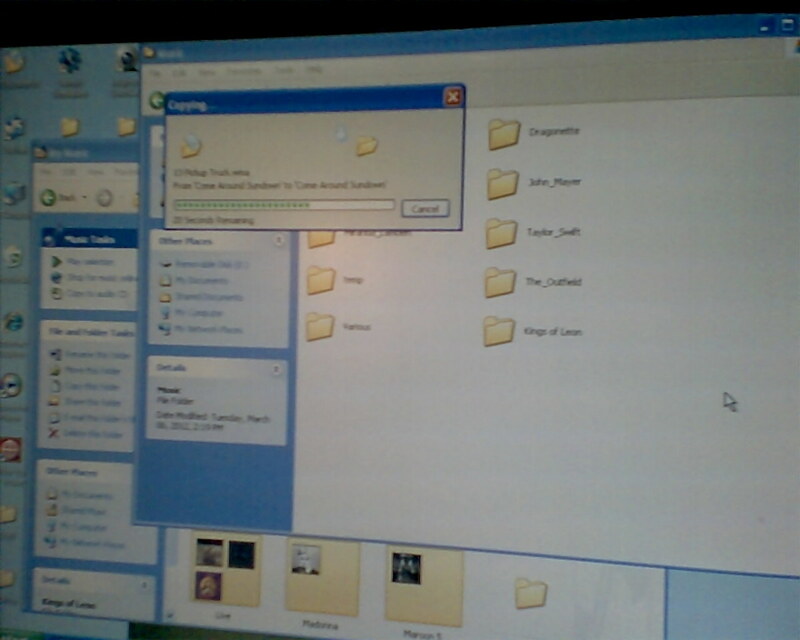 The photo gallery also shows screen shots of how I did that. 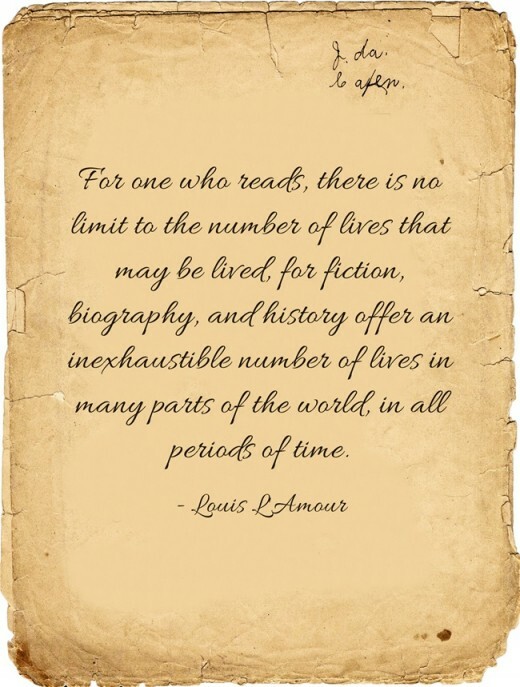 One really neat feature is the “Time to Read” information. You can customize this so that you can see how much time it should take you to finish the chapter or the book. Mine is currently set to tell me on the bottom left how long it will take me to finish the book, and on the bottom right it tells me what percentage of the book I have already read. I just learned how to use the search feature tonight. It just works within a book. You just tap the top of the screen to bring up the tool bar and then tap the magnifying glass. That will open a search box and you can type in the first letters of the term you want. The Kindle will suggest terms that begin with those letters and you can just tap the one you want. Then the results include every instance of that term in the book, so be careful what you enter. In some of the screen shots I've used you will see ads for books. 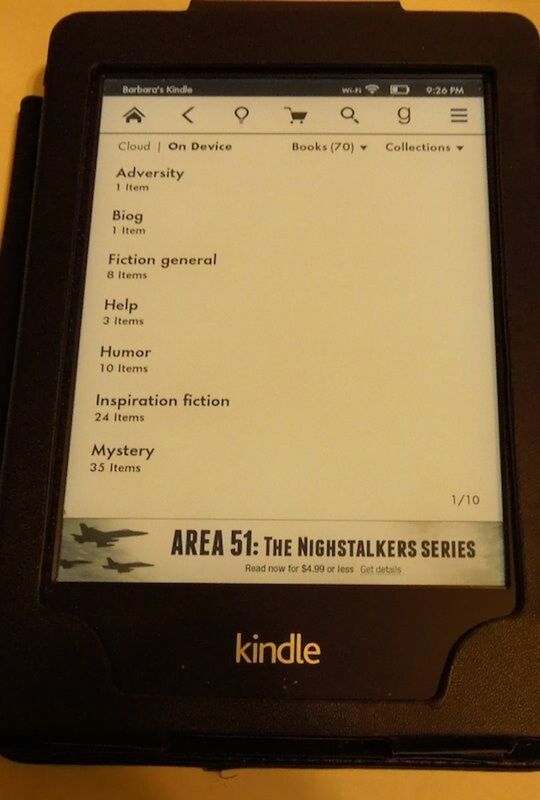 I choose to buy the Kindle edition that displays ads, because it's cheaper. I have not found these ads to be distracting, since they don't show on the text pages when I'm reading. I'm not sorry I chose this option. 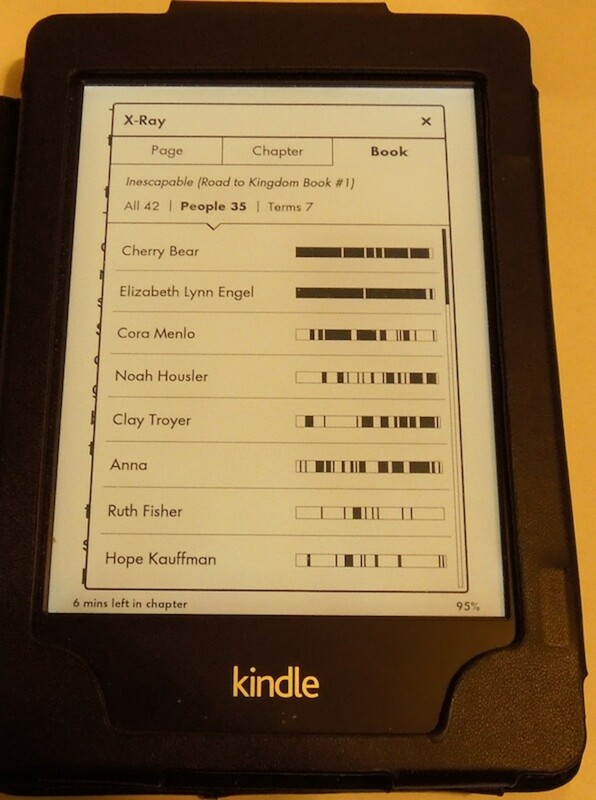 The photo of my Kindle screen above shows a page from a book I downloaded about finding free books. I wanted you to see the icons at the top and the "Time to Read" feature at the bottom. It is currently set to show the page numbers on the left and the time left to read the chapter at the right. You can change these setting to suit yourself. Why Not Get Yourself a Kindle Paperwhite? - I think if you try it, you'll be glad you did. Because I wanted to protect my new Kindle Paperwhite, I also bought a padded case for it. Because I didn't want to be tied to a computer to charge it, I bought a charger. I bought the stand because I was about to have foot surgery and I would be confined to a recliner with my feet up, using a lap desk. The stand made it easy to use the Kindle hands-free so I could read while I ate if I wanted to. It works that way with a regular table, too. It was also very handy in the hospital after my neck surgery when I couldn't bend my head down to read. 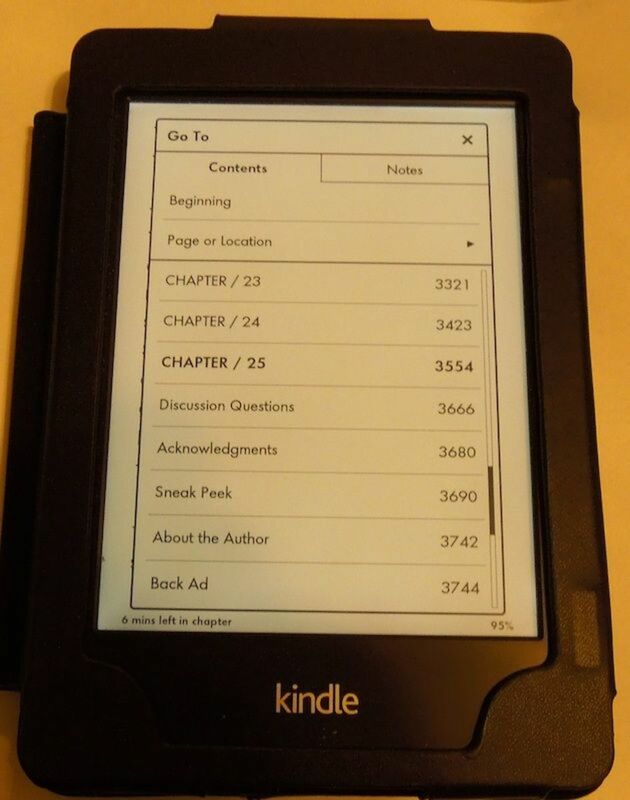 This is the newer version of the Kindle I bought that I'm reviewing on this page. 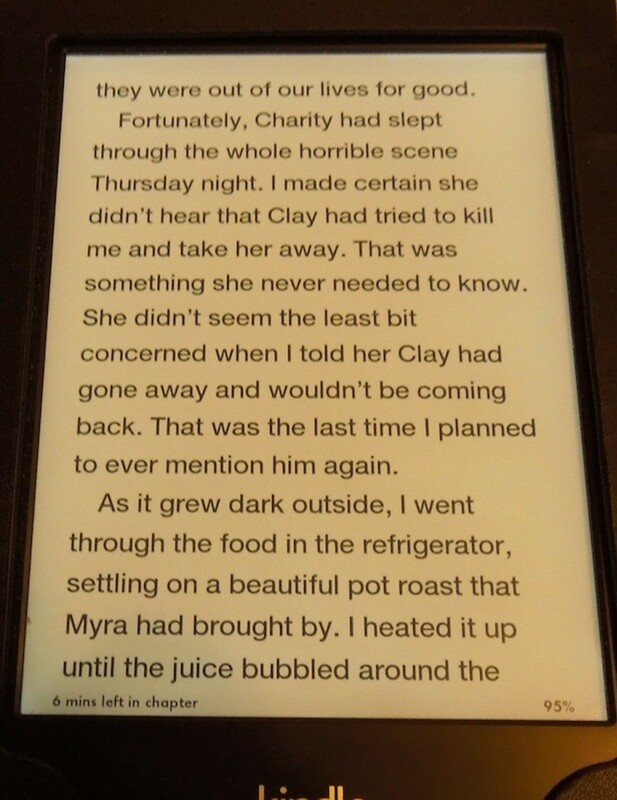 Screen Shots from My Kindle Paperwhite - You may want to refer to these as you read what I wrote about the features. 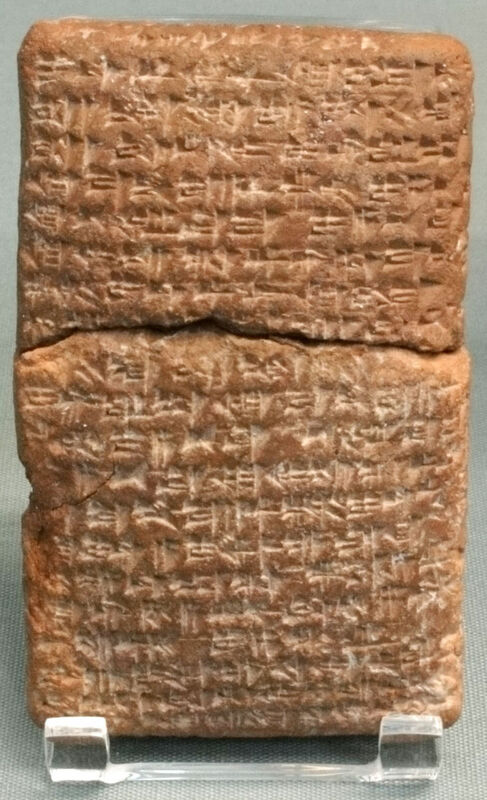 This is a page of text with the print size selected in the screen shot below. This screen is what you will get when you click on the Aa icon at the left of the screen near the top. Use it to change font size and style. Here I selected the largest print size for the same page, but, of course, not as much of it shows on one screen. This is an X-Ray screen open to find all the characters in Inescapable. The right shows marks for the pages where they appear. This screen shows the first page of my Collections. 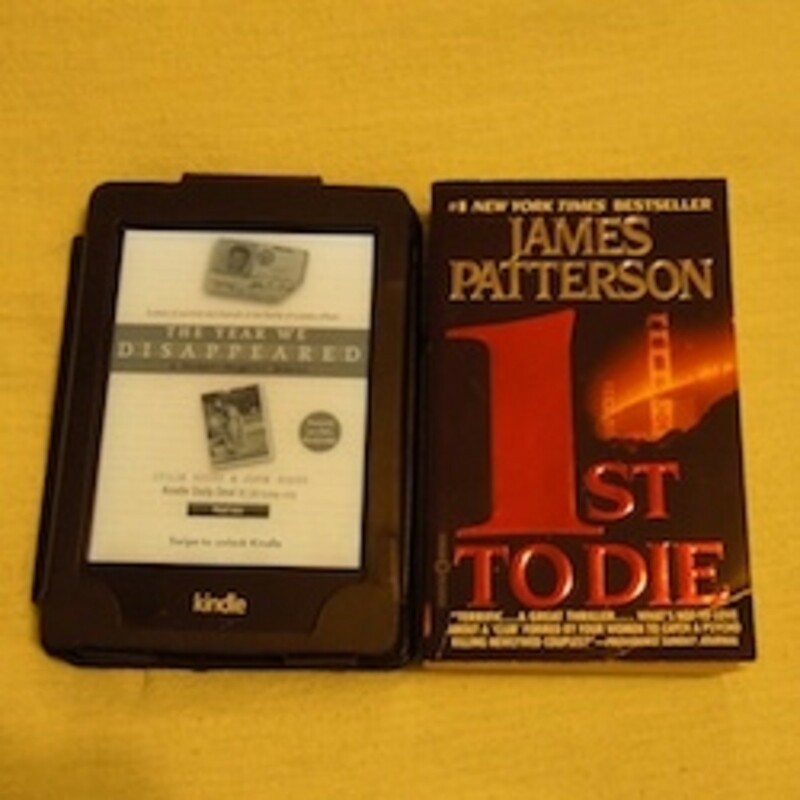 Kindle or Paper? - What do you think? Are you ready to buy a Kindle Paperwhite yet? Yes. You've convinced me that it's time to make the switch. I already have an e-book reader I'm happy with. 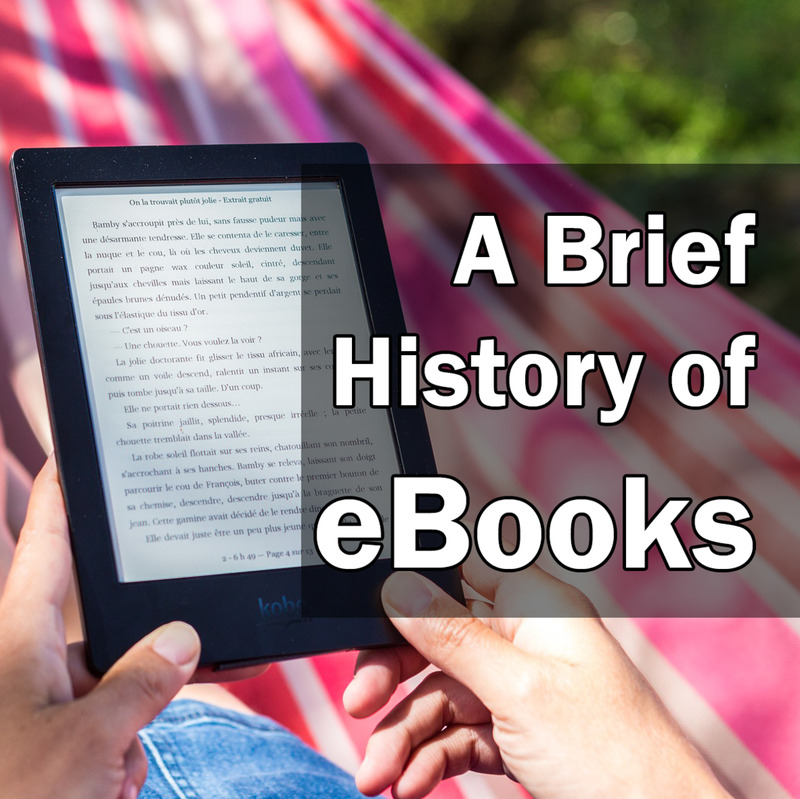 I read e-books on other devices. I'm still happy with paper. There are some ways in which paper books are better. Let’s face it. Paper books are easier to navigate. 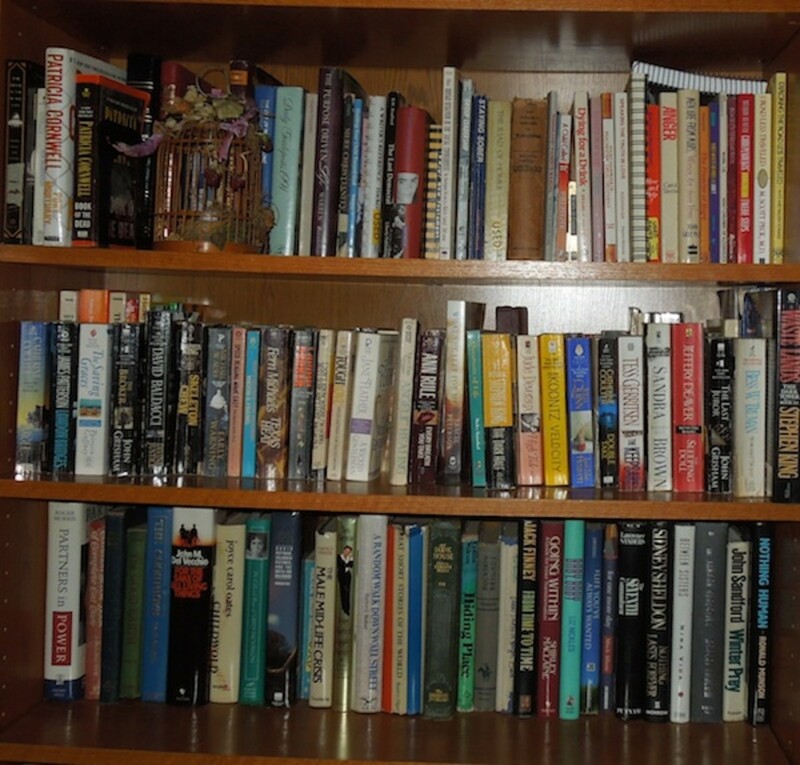 First, I can walk right over to a bookshelf and scan the spines to quickly find the book I want to read. In Kindle, I have to organize my books. I have them organized into collections that are organized by subject, as well as one for books I’ve already read. (See screen shot in gallery above.) I have so many collections they take up more than one page. So to get to see the rest of them I have click the number in the bottom right corner to bring up the “Go To” screen and take a guess at the page number I need to find the collection I want and type it in. If I prefer, I can tap the box under the page number box to find a collection title starting with a certain letter. Let’s say I want to read a book from my Mystery collection. I need to bring up the collection title, which is, fortunately on the first page of my collections. I need to tap it to open it. Since I have 35 mysteries at the moment I need to find the right one by the same process I used to find the collection. There are five pages of titles. To pick a book by title I have to remember what it starts with. Or I can guess what page I will l find the title on. Books I’ve recently been reading are at the top so they are at least easy to find. But it’s sure easier just to go to a bookcase and grab book off the shelf. When I reviewed Inescapable, I wanted to reread parts of the book. In a paper book I would just thumb through the pages until I found what I wanted. Maybe I would put a sticky note or bookmark on those pages. I could continue to flip back and forth if I needed to. Although I can also bookmark pages in my Kindle, they get bookmarked by something called ”location.” When I want to find the bookmarked page, I have to know the location number to find it. That means I have to write down those numbers with a note as to why the bookmarked page is important. I find this frustrating. My most frustrating experience in my Kindle so far has been trying to read a Bible. It is really hard to navigate. First I had to navigate through the Table of Contents to find the book of the Bible I wanted to read. Then I had to pick the chapter of that book I wanted to read. But I seemed to land on the footnotes instead of the text and I had to fiddle around by trial and error to finally get to the text. When I wanted to go back a page, I landed back in the footnotes. It didn’t work that way with the Psalms. 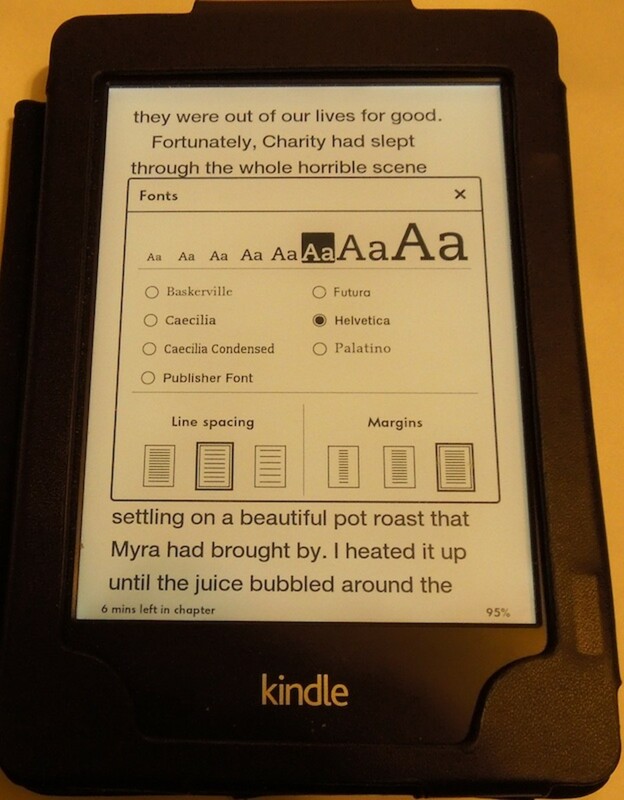 The Kindle has a learning curve. You will have to accept that and learn what you need to if you are to be able to use all the features you want. I suggest getting a good user manual at the same time you buy your Kindle. My paper books always work the way they are supposed to. Sometimes my Kindle will freeze and I have to shut it down and restart it before I can turn the page. It doesn’t happen often, but it never happens with a paper book. When I read a paper book, there’s no battery to recharge. My Kindle supposedly only needs to be recharged every two months. But there’s a catch to that. It assumes you only use it for half an hour a day. I find I have to recharge mine after every book or two. That is about three days to a week. That being said, I am mindful that the Kindle Paperwhite is limited by the fact that it is an electronic device and has many of the same kinds of limitations a computer does. It also does some things much better than a paper book, including providing its own light source, making it easy to adjust text size, keeping your place intact for several books at once, and holding lots of books in a small space. This has been a godsend to me. After my neck surgery I had to wear a hard collar for two weeks and could not bend my head down to read in the normal way. This held my Kindle where I could see it easily. It's also great if you like to read when you're eating alone. Do you have anything to add or any questions you want to ask? You can use the comments to do that. 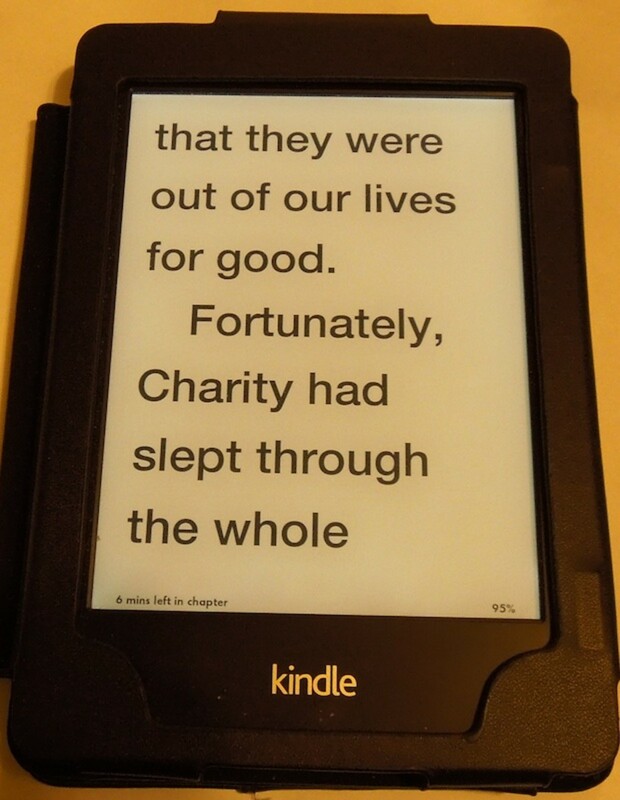 Thank you for taking a look at my Kindle Paperwhite - I hope I've helped you see its strengths and weaknesses. Do you have to be on the Internet to use this kindle? I resisted for a long time, but now I wouldn't be without my Kindle. I recently bought a second one. 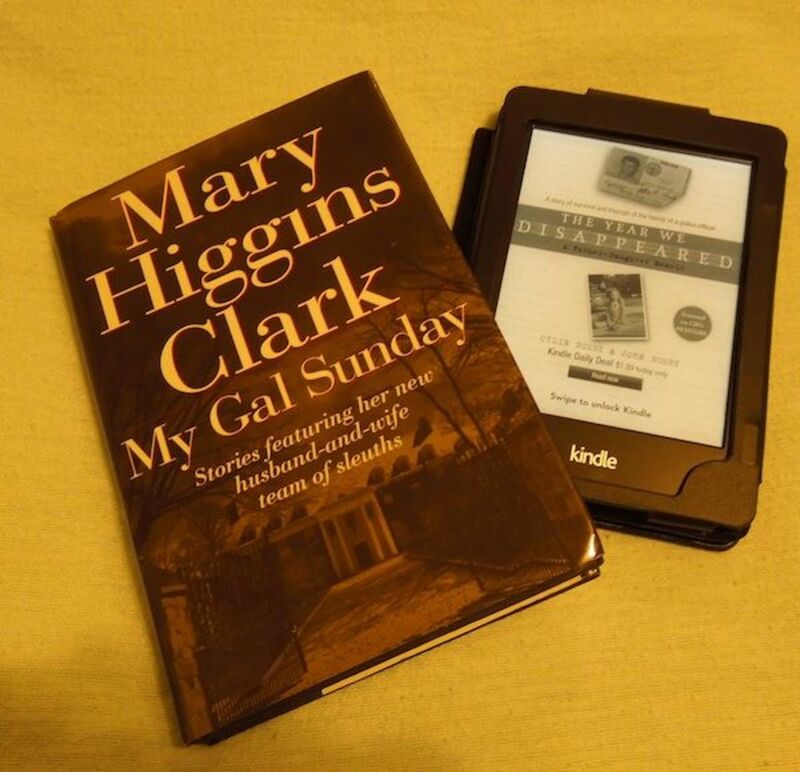 I don't know the first thing about any kind of Kindle but my wife is a dab hand at using (and buying!) 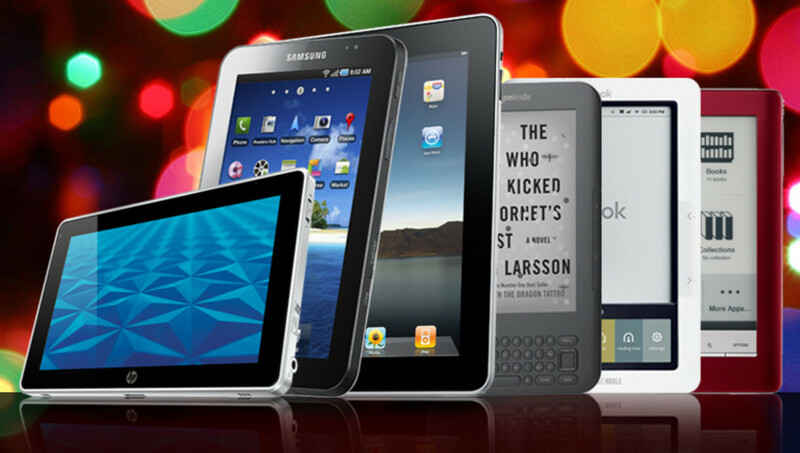 all types of electronic book readers. I will tell her about this review. I've been thinking about investing in a Kindle. Kristen, sounds to me like that's a great way to get a Kindle. 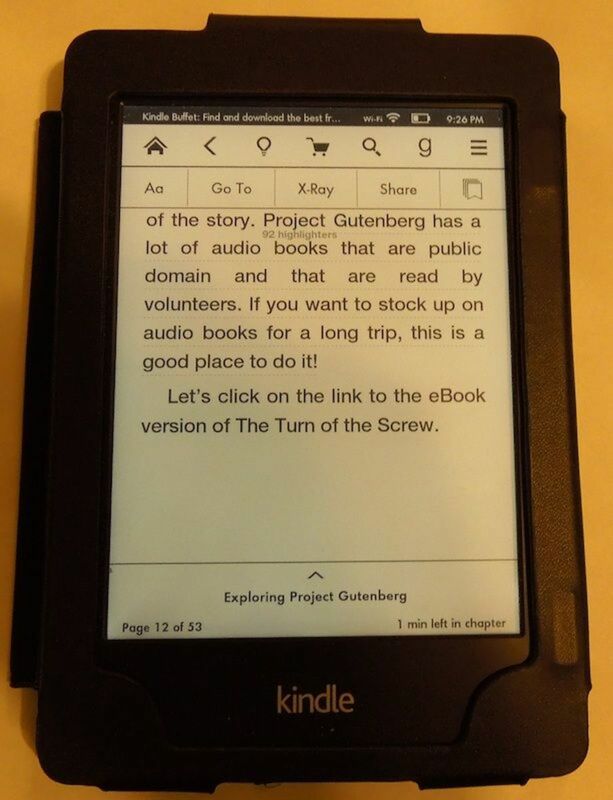 Can't you use the Kindle reading app on your computer or in the Cloud to store books you've read so you have more room on your Kindle for new ones? 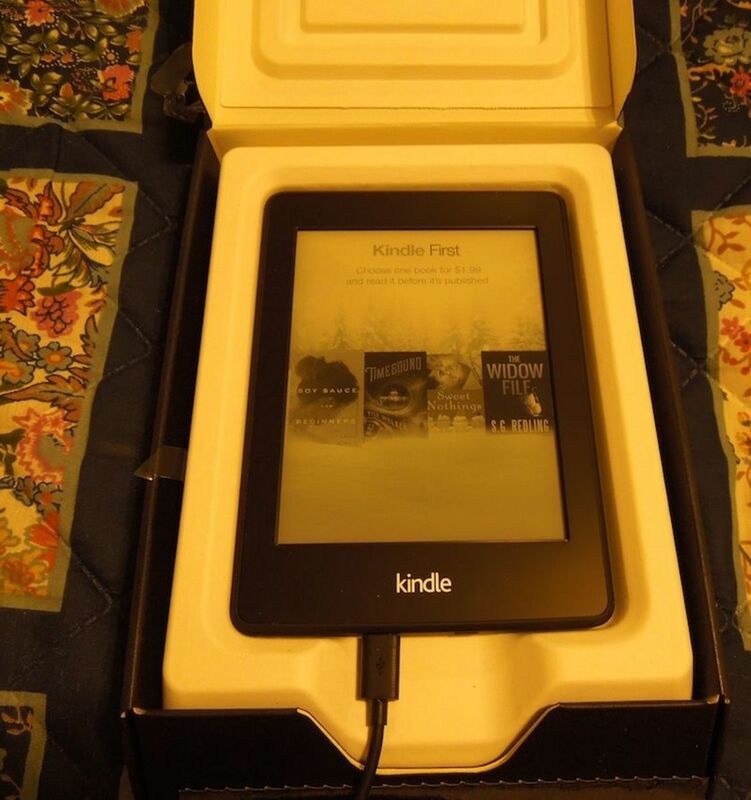 I've won my Kindle Paperwhite, 2.5 years ago, via an author fan club contest on Facebook. I love it. Although I'm on Kindle limbo, since I can't download any more ebooks, since I've reached 1300 ebooks, due to space issues. 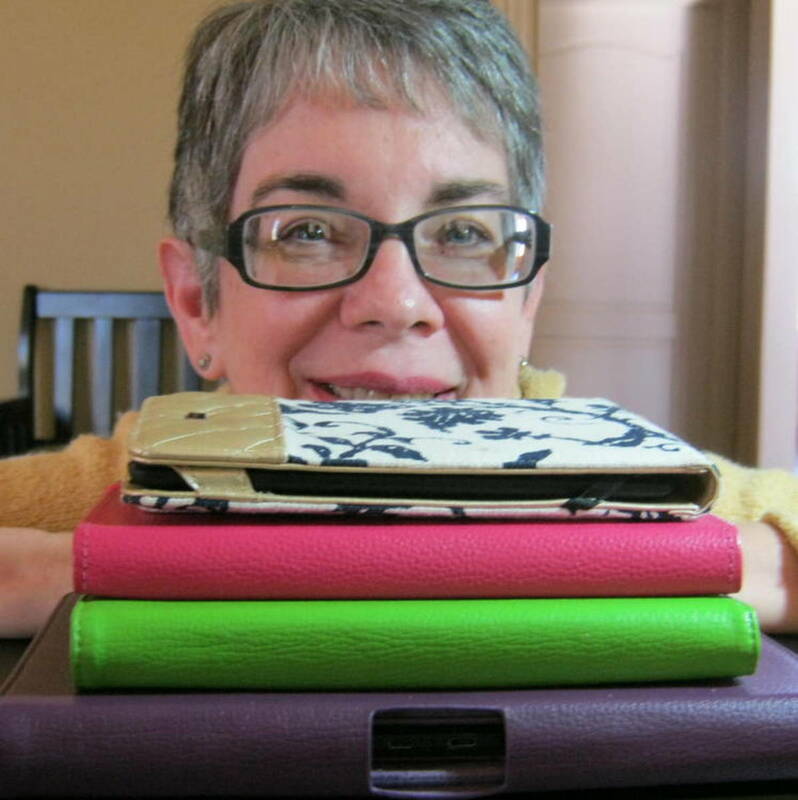 @DebMartin: I think as far as Kindles go, if you want to just read the books, it's the best one. Of course if you want to surf the internet, etc. 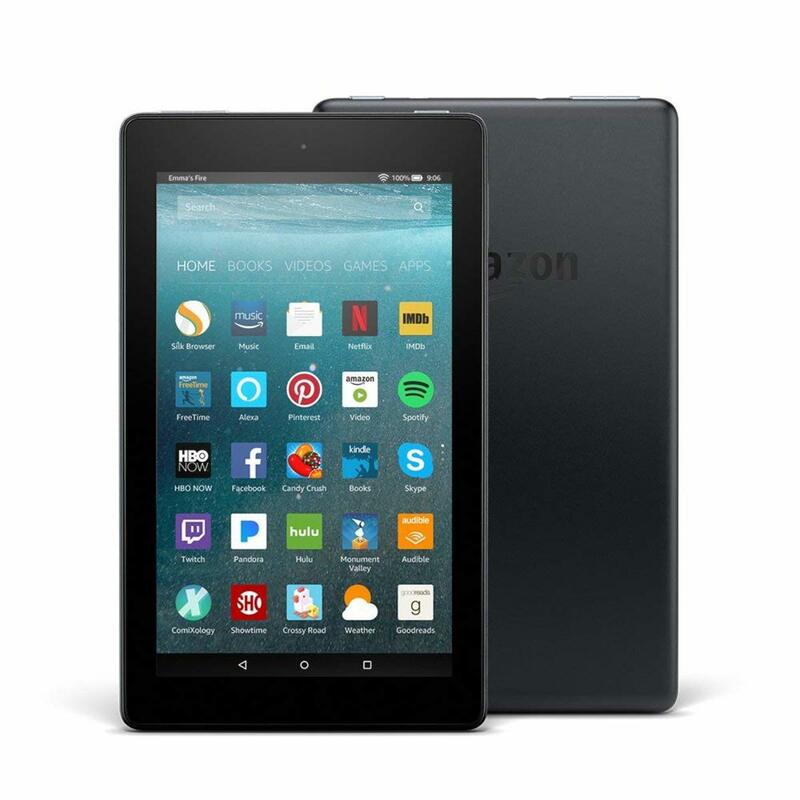 I guess you'd want a Kindle Fire. I just want to download and read books. @Brite-Ideas: I still have more to learn, but I do appreciate its convenience. There is no doubt you know your stuff about Kindle! @SusanDeppner: In which direction do you swipe? I've tried down the list and across the page near the middle, but nothing happens. Maybe I'm doing it wrong.